The inconvenient truth about a Trade War is that you actually have to pay for it as you go. The weapons of a trade war—restricting our own desires to buy a trading partner’s goods until they cry uncle—are by definition pay-as-you-go. It hurts here and now. It may or may not disturb our sensibilities, but it is likely to deeply disrupt our lifestyle. As a result, democracies are not nearly as good at this as a more tightly controlled autocratic style system. It is a game that must be played with incredible skill, especially in a democracy. The President thinks trade wars are easy and winnable. They are neither, as we are learning the hard way. War is hell. But conventional war—military actions we normally think of as war—is different than a trade war. The United States has engaged in many conventional wars. They are horrendous activities that cost American lives and many hundreds of billions of dollars. Wars are heavily debated and much anguished over, as they should be. However, American wars have one convenient feature. They are conducted by professionals who have opted to join the military, they happen far away, and no one seems to have to pay for it because the government borrows the money. There is no Afghanistan War surtax this year. Or any year. Debt explodes, but that is someone else’s problem (our grandchildren, I suppose). A conventional war witnessed on the news can disturb our sensibilities, but it doesn’t disrupt our lifestyles. As a result, it can be waged even by a democracy. The inconvenient truth about a Trade War, however, is that you actually have to pay for it as you go. The weapons of a trade war—restricting our own desires to buy a trading partner’s goods until they cry uncle—are by definition pay-as-you-go. It hurts here and now. There is no professional army to send off to fight. It is not conducted far away. There is no deflecting the costs into the distant future. It may or may not disturb our sensibilities, but it can deeply disrupt our lifestyle. Yes, there are winners and losers in a trade war. On the other hand, trade liberalization creates winners and losers. Protectionism creates winners and losers. Policy stasis creates winners and losers. The creative destruction of capitalism inevitably leaves winners and losers in its wake. This is the great advantage of free and open markets. The problem is that because a trade war is both up-front-and-personal and pay-as-you-go, it is extremely hard for a democracy to conduct it well. The intense pressures being put on the Administration by the ‘losers’ are highly likely to get the President to blink (if his immigration enforcement is any indicator). Many will be relieved when the President caves. The truth is, however, that caving is not the right solution. Trade is a positive-sum activity– more is good. But trade policy in every country (including the United States) is essentially mercantilist. Trade negotiations are about reducing the barriers created by domestic politics. It is often ‘war by other means,’ and at times it must be aggressive. The United States has used its economic muscle to twist other countries into policies we prefer. Every country that can do it does do it. China is showing great deftness at this game. When negotiations get too aggressive, we call it war. The question is how to do it well. It is a game that must be played with incredible skill, especially in a democracy. It can require more skill than for a military conflict because the weapons impose immediate costs—who will pay tariffs immediately and who will soon be punished by retaliatory tariffs. The range and scope of these weapons, and their consequences, will be determined a little by strategy, a lot by luck and a whole lot by sheer special interest politics. Clearly the United States is not doing it well. The U.S. non-strategy is impulsive, insular, ill-conceived, and ignores key stakeholders. The internal battle among Trump and parts of his own administration and the Republicans in Congress over how to punish or to aid the Chinese industrial giant ZTE is a good example. ZTE, a serial violator of US law, is facing both severe punishment and tactical support by various parts of the Trump Administration. Both sides of this intra-Party fight are trying to best use this weapon in the trade “war” with China, but at bewildering cross-purposes. Here is the larger problem. Good strategic trade policy identifies the two, maybe three critical objectives, carefully aligns weapons and allies, and targets the battle to those objectives. Team Trump has opened fronts willy-nilly across the globe. Losers abound (see Harley-Davidson), winners are uncertain, allies are alienated, and any important objectives are lost in the melee. As the losers garner political support, the weapons for an effective trade war shift and wane, and eventually disappear. The most important point is that even a brilliant trade policy conducted in a well-functioning democracy is at a disadvantage in the face of a strong authoritarian system, where decisions are made by a “technocratic elite of highly-educated bureaucrats under party control” with both the authority to effectively apply its economic weapons and the patience to employ them for the duration. It is not at all clear a democracy can win against such an opponent. It is certainly clear that a lone democracy—even the largest one– confronting a very large and determined authoritarian structure should not open simultaneous fronts against every possible ally. This self-destructive strategy seems to be exactly how Team Trump is conducting the war. Not to mention that no one seems to know just what success actually means to the Team. We will likely get all the destruction without any of the creation. The most likely outcome to this ill-conceived multi-front trade war will be a group of solidly antagonized trade partners, substantial damage to the multilateral infrastructure, an end to unified support to help draw China into a liberal ruled base trading system, and a growing sense of defensive nationalism across the globe that will require years of exceptionally good diplomacy to overcome. Robert A. Rogowsky is Professor and Program Co-chair of the Masters in International Trade & Economic Diplomacy at the Middlebury Institute of International Studies in Monterey, CA and Adjunct Professor of Trade & Diplomacy at Georgetown University’s Masters School of Foreign Service. These essays are the opinions strictly of the author. They do not necessarily reflect the views of the Institute or any officials of the Institute. History Doesn’t Repeat, But it is Rhyming Like Crazy. As we daily explore the consequences of discombobulation diplomacy—of which an important subset is what Ed Luce has exquisitely labeled “diplotainment”—we plumb ever deeper levels of concern for America’s future, for Pax Americana, and for the liberal order in general. China, we hear regularly is playing ‘the long game.’ The United States does not seem at all in that game. Contrasting transactional impulse-driven diplotainment to the long game draws us to lessons history might offer. Those who do not know history are destined to repeat it. The consequences can be grim. Ed Luce looks further back, insightfully and grimly comparing U.S. politics today to Nero’s Rome as it begins its mutation from Republic to Empire. Trump is taking care of the circuses, Luce warns, but how long will the bread last? At some point, Trump’s trade rhetoric must start to jeopardize growth. In the spirit that history does indeed rhyme, I find perhaps history’s most valuable warning for us—and the long game—is a more recent story. I am thoroughly enjoying the task of reading Henry Kissinger’s 1994 classic Diplomacy. I stumbled into a reverse déjà vu in 19th century Europe as Bismarck perfects the Realpolitik long game to create a new, dominating Great Power. It is an eery parallel to today. With full credit to Prof. Kissinger (specifically Chapter 5), let me retell his story. With the defeat of Napoleon Bonaparte and 25 years of near constant war across the continent, the Great Powers of Europe formed the Congress of Vienna in 1815. The “Congress” was to be a vehicle for discussions to resolve disputes among the Europe states. It was a carefully designed web of relationships based on respect for sovereign states and suppressing disruptive liberalizing (i.e., democratic) efforts that would disturb the equilibrium. Through “congresses and careful diplomacy,” especially the efforts of the brilliant Austrian foreign minister Klemens von Metternich and like-minded statesmen in England, France and Russia, war in Europe was avoided for four decades. Sadly, the carefully constructed system that brought peace for the first half of the 19th century succumbed to new ambitious, competing personalities. Emperor Napoleon Bonaparte III—nephew of the great general defeated at Waterloo– was voted into the French presidency in 1848. Erratic, ambitious and with an overly grand sense of himself, he successfully overturned the constitutional prohibition on his re-election and proclaimed the Second French Empire. An empire needs an emperor and in 1852 he dutifully appointed himself to the job. In his [Napoleon’s] eyes foreign policy is only an instrument he uses to secure his rule in France; to legitimize his throne, to found his dynasty. …[H]e would not shrink from any means, from any combination which suited itself to make him popular at home. Bonaparte’s nemesis, Bismarck, was not at all confused and played Bonaparte brilliantly. After antagonizing Russia, Bonaparte III offered neutrality to Prussia as he encouraged a war between Prussia and Austria. But, expecting Austria to prevail, then offered alliance to them. The loose and fiercely independent German states were held apart by the Congress of Vienna and Metternich’s strategic diplomacy. Bonaparte’s feckless efforts created for Bismarck the overwhelming external threat needed to pull the contrary members of the confederation together under Prussia leadership in defense of the attack by a hapless and declining Austria. The rising military and industrial power of the German Confederation now fell under the control of the militaristic Prussia, which in turn was firmly under the ambitious, hand of Bismarck. Germany became a dominant, ambitious new Great Power—the Second Reich— set on using its growing industrial and military powers to realize its continental ambitions. World Wars I and II followed. Germany’s nationalism “unleavened by democracy” turned increasingly chauvinistic and militant. Raw power became the currency of the realm. The same is happening now on a global scale. U.S. trade policy seems to be trying to harness Bismarck but is channeling Bonaparte III. China will soon enough be 25% larger than the United States and the dominant trading partner for virtually every nation on earth. The existential destructiveness of modern weaponry means that economic power is the most important form of power. China is no stranger to clear and effective application of it. To handle a rising China, the United States and China need Metternichs. We elected a Bonaparte III. China selected a Bismarck. It is certain that we are galloping headlong into rough waters. History does not offer grounds for much optimism. Author Robert A. RogowskyPosted on June 21, 2018 Categories BlogsLeave a comment on History Doesn’t Repeat, But it is Rhyming Like Crazy. U.S. industry in general has been strongly supportive of trade liberalization. There are, of course, a few exceptions, like steel, textiles and footwear, and a few select agricultural products. And I do mean a few. One Ag expert once told my trade class that if it’s white, it’s protected: sugar, cotton, milk, and rice. Everything else is on its own. However, for the most part, U.S. industry understands the modern global economy and America’s role in developing a global marketplace in which American industry can thrive. Consequently, Republicans in Congress and the White House historically have been extremely supportive of globalization, multilateralism, and trade liberalization. Labor union leaders and certain public interest and environmental groups have opposed trade liberalization with varying degrees of intensity. For them, its about losing jobs to foreigners and harm to the environment. As a result, Democrats in Congress and the Oval Office have sat in opposition to trade agreements, or are at least been deeply reluctant. In contrast, according to a series of Pew Research surveys over the past half-decade, nearly twice as many Americans see trade as a good thing as those who see it as a bad thing. Middle class, and the college educated respondents are the most supportive. Ironically, Democrats have for many years been more supportive of trade than Republicans. In fact, both Republicans and Democrats across the nation are much more supportive of trade and support trade agreements, like the Trans-Pacific Partnership (TPP) and NAFTA, than their representatives in Washington. The long-term disconnect between the American people and their representatives on international trade is disturbing. Not surprisingly, things got even more disjointed in the last election. Thanks to Trump’s relentless attacks on trade, Republican support for multilateralism and trade liberalization plummeted. It fell from well above 50% supportive to below 30% during the campaign. The good news is that it has now climbed back to about 43%. A silver lining in the dark cloud Trump has created over trade is that Democrats increased their support for trade, even though their representatives in Congress have not. More tellingly, the percentage of Democrats who view trade agreements as “bad for the U.S.” has dropped by half over the past 6 years. If ‘the enemy of my enemy is my friend,’ perhaps Democrats in Washington can now embrace trade agreements because Trump hates them. It would at least get them more in line with their many constituents, at least those who are not Labor Union Leaders. To compound this disruption, we now also have the spectacle of the Republicans in Washington at war with themselves over trade. There is every indication that this war will heat up dramatically heading toward the November election given Trump’s growing animosity toward our most important trading partners and Congressional Republicans’ apparent willingness to take him on. It is clear that a large majority of Americans recognize the dynamic nature of global competition and the remarkable success of our own economy in it. Americans seem to recognize that trade agreements are about creating an open, rules-based trading system that is a key source of economic growth and prosperity for Americans. The exploding Asian middle-class offers a vast new market for America’s products. Effective trade strategy should to break down barriers between those consumers and American businesses. Dropping out of the Trans-Pacific Partnership—now re-forming without the U.S– will not help. The current discombobulated economic diplomacy, driven by inter-party warfare, intra-party warfare, and intra-Executive Office warfare at the highest levels, is a poor strategy. Members of Congress and the White House regularly express their deep concern for their constituents but work in concert against them. Washington today seems incapable of producing a coherent trade policy that will further open Asia’s rapidly growing markets, strengthen American global leadership, and build effective strategic partnerships with our North American neighbors and European allies. Perhaps for starters, Washington should seriously re-connect with its constituents. 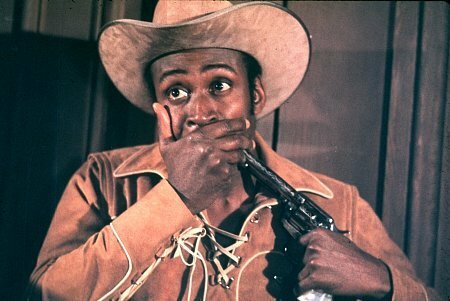 I can’t think of trade wars without recalling the scene from Mel Brooks’ iconic movie Blazing Saddles. The small, all white western town of Rock Ridge anxiously awaits its sheriff. A black man (Cleavon Little) shows up dressed in gold. Realizing their intense hostility to a black man parading himself as sheriff, he draws his gun, puts it to his own head, and takes himself hostage. The town, befuddled by the cognitive dissonance of a black stranger taking their sheriff hostage, lets him drag himself to the safety of the sheriff’s office. Catastrophe avoided; life, weird and confused, goes on because, well, life has to go on even in the face of life’s various dissonances. Trade wars are a lot like this: nation’s taking themselves hostage to inflict pain on someone else. That is why there are always winners and losers in a trade war, just as there are always winners and losers in a trade peace. In fact, commercial activity and economic progress always means there are winners and losers. Recall the long-gone and little lamented buggy whip manufacturers. One trade scholar described trade theory as the study of whose hand is in whose pocket, and trade policy as who will be pulling it out first. When we restrict imports, it punishes both domestic interests and our trading https://ixquick-proxy.com/do/spg/show_picture.pl?l=english&rais=1&oiu=http%3A%2F%2Fspencemunsinger.com%2Fwp-content%2Fuploads%2F2013%2F02%2FblazingSaddles.jpg&https://ixquick-proxy.com/do/spg/show_picture.pl?l=english&rais=1&oiu=http%3A%2F%2Fspencemunsinger.com%2Fwp-content%2Fuploads%2F2013%2F02%2FblazingSaddles.jpg&sp=643fd38774d6b67d0a8731b9c85f1a96sp=643fd38774d6b67d0a8731b9c85f1a96partners (reminder: these are not enemies, they are allies and partners in our economic progress who buy our stuff and sell us their stuff). Because we have punished them, they must retaliate. When they do, we counter-retaliate. Hence, war. The problem, again, is the weapon. We block our purchases of their products, which some of us want. We shoot them in the foot, but through our own foot, or calf or thigh, depending on how recalcitrant our retaliating trading partners feel compelled to be. We hope that enough blood spatters on them to force surrender. When George W. Bush imposed steel tariffs in 2002, retaliation was focused on Florida oranges, cars produced in Michigan, and other products in key swing states. The United States withdrew the tariffs on December 4. When the EU refused to let U.S. beef into European stores, the U.S. retaliated with tariffs on beef and pork products, goose pâté, Roquefort cheese, truffles, onions, carrots, preserved tomatoes, soups, yarn, Dijon mustard, juices, chicory, toasted breads, French chocolate, and jams, as well as agricultural-based byproducts, such as glue and wool grease. The list targeted especially France, Germany, Italy, and Denmark, Products from the United Kingdom were excluded because they had indicated support for lifting the ban. The hard part with this weapon is to find goods for which trade will hurt the enemy more than yourself. In our trade skirmishes with the Japanese over autos under President Reagan, tariffs on luxury Japanese cars were initially thought strategically sound because rich U.S. consumers could afford it. Unfortunately, they were both unwilling and politically connected. That weapon was quickly withdrawn. Trump’s trade war (sorry Mr. Kudlow, I mean “discussion”) has, of course, spurred retaliation. Canada, for instance, released a strategic swing state response targeting Mr. Ryan’s home state of Wisconsin—dairy, Harley-Davidson motorcycles, and his own district’s big cucumber and gherkin industry. Also making the list is Mitch McConnell’s Kentucky bourbon, Bernie Sander’s Vermont maple syrup, Pennsylvania’s Hershey chocolate, and Florida’s fresh orange juice, along with beer kegs, mineral water and soy sauce, mayonnaise, salad dressing, automatic dishwasher detergents and certain types of plywood. The weapons for a trade war are crude and Pyrrhic. They must be used carefully and strategically with an eye to the political pressure points that will make the ‘enemy’ blink before your own wounded make you blink. Fair warning Messrs Ryan, McConnell, Sanders, and of course Trump as we head into the November referendum. Some very carefully devised punishments will force selected domestic sectors to pay for the special subsidies given to steel and aluminum. The question is how they will make you pay? According to the Government Accountability Office, between 2007 and 2011 Uncle Sam paid some $3m in subsidies to 2,300 farms where no crop of any sort was grown. Between 2008 and 2012, $10.6m was paid to farmers who had been dead for over a year. The U.S. Department of Agriculture (USDA) runs more than 60 direct and indirect aid programs for farmers.Most of the direct aid goes to producers of a handful of field crops, not to livestock producers or fruit and vegetable growers. In the three largest farm subsidy programs — insurance, ARC, and PLC — more than 70 percent of the handouts go to farmers of just three crops — corn, soybeans, and wheat. The blogs on this site are the opinions strictly of the author. They do not necessarily reflect the views of the Institute or any officials of the Institute. Are you a Business Manager, Government Official, NGO Professional or Student interested in international trade? Strengthen your professional skills in analyzing trade issues, influencing trade and invest policies and negotiating trade agreements. ITCD is at the forefront of Commercial Diplomacy training by combining comprehensive materials and state-of-the-art technologies.